Bridges of Paris is a large-format photography book with over 350 original color images which casts new illumination on the City of Light. The 37 bridges over the Seine River emerge as beautiful, historic destinations rather than unnoticed thoroughfares. The book features stunning portraits of each bridge as well as intimate riverside moments. Once you've experienced this river tour, you will never see Paris the same way again. 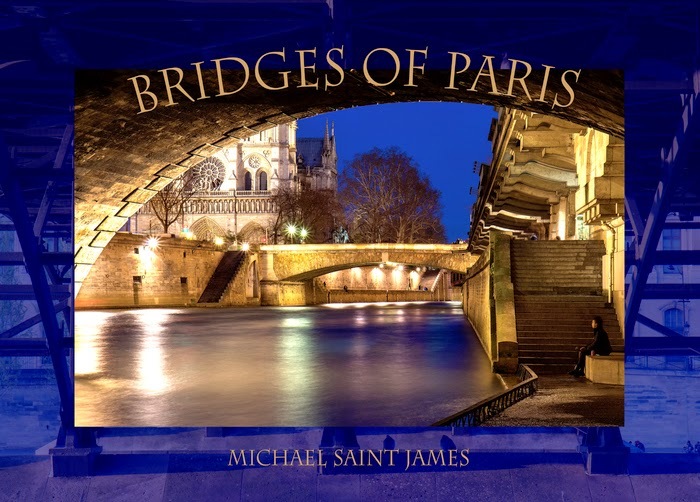 Living as a Parisian for a year, author Michael Saint James left his American lifestyle and spent his days and nights capturing images from over, on, beside and under the bridges of Paris. With over 30 years experience as a photographer, educator and world traveler, Michael immersed himself in French culture to search out his authentic artist self. The result is a visual treasure to share with everyone. Normally, I veer away from large, cumbersome books. They don't fit nicely on the shelf and quite often, they're not something that I want sitting on my coffee table long term. This book completely defied all of my normal "rules" and before I knew it, I was lost in Paris. I've never been there, but I'm a lover of architecture and of history and this book combines both of them into one marvelous volume. With over 350 beautiful photos, I found that I couldn't put the book down. I couldn't wait to see which bridge he had spent so much time at next and all of the information about it. Honestly, if the tourism industry in Paris doesn't take this book and run with it, they're crazy. I mean, if this girl from the midwest suddenly has dreams of exploring bridges in Paris, then there have to be a lot of others who would enjoy that experience.